PASCAGOULA, Miss., Oct. 20, 2012 (GLOBE NEWSWIRE) -- Huntington Ingalls Industries' (NYSE:HII) Ingalls Shipbuilding division today christened the multi-purpose amphibious assault ship America (LHA 6). The ship, the first in a new class, is the fourth U.S. Navy vessel to be named America, extending a legacy dating back to 1861. 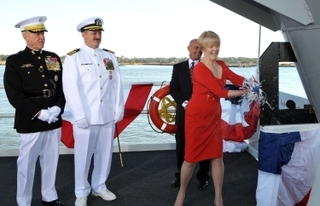 Lynne Pace, wife of retired U.S. Marine Corps Gen. Peter Pace, former chairman of the Joint Chiefs of Staff, served as the ship's sponsor. "Thank you for building such a magnificent ship," said Pace, who had the honor of smashing a bottle of sparkling wine across the bow of the ship. "You have put love, care and incredible craftsmanship into it. You are Americans working on an American ship that will carry Americans defending the American lifestyle." Gen. James F. Amos, commandant of the U.S. Marine Corps, served as the keynote speaker. "Know that your Navy and Marine Corps team will put America to good use," he said, addressing an audience of about 2,000 onlookers. "As we celebrate this moment, rest assured that this ship will play an important role in keeping our nation secure and its liberty and interests secure for decades to come." When America enters the fleet, she will be the flagship of an Expeditionary Strike Group, strategically positioning Marine Expeditionary units ashore on a full spectrum of missions including humanitarian, disaster relief, maritime security, antipiracy and other operations while providing air support for ground forces. "This ship, America, and others like her are being built by HII for the administration after next – for use on behalf of the generation after next," said HII President and CEO Mike Petters. "We build ships to help accomplish missions of the future, and most of those missions are unknown today. At HII, it's a job we've taken very seriously for more than a century." Ingalls has built 13 amphibious assault ships: five in the Tarawa (LHA 1) class and eight in the Wasp (LHD 1) class. HII received a $2.38 billion contract in May to build Tripoli (LHA 7), the next ship in the America class. "No other shipyard in the United States can boast the amount of experience that Ingalls has in the production of these critically important ships," said Ingalls Shipbuilding President Irwin F. Edenzon. "But more importantly, we build quality ships. Our shipbuilders know that the ships we build carry sailors and marines who are our friends, our neighbors, our sons, daughters, nieces and nephews--America's heroes." America-class ships are 844 feet long, 106 feet wide and will displace 44,971 long tons. The gas turbine propulsion system will drive the ships in excess of 20 knots. They will accommodate 1,059 crew (65 officers) and 1,687 troops. The America-class will be capable of carrying a Marine Expeditionary Unit, including Marine helicopters, MV‐22 Osprey tiltrotor aircraft and F‐35B Joint Strike Fighter (JSF) aircraft. The newest class has an increased aviation capacity to include an enlarged hangar deck, realignment and expansion of the aviation maintenance facilities, a significant increase in available stowage for parts and support equipment, and increased aviation fuel capacity.